Can we agree on a few matters important to most golfers and to golf? The par-3 course at Augusta may be the most famous short course, but it isn't the only. Having to wait on almost every shot during a round is one of the most irritating things in golf. Bringing more kids, women, seniors, Baby Boomers, people of all ages is the way to grow golf. A problem with beginning golfers playing on a regular golf course before they are sufficiently prepared is they will slow down the pace of play for experienced golfers. It would be better to have a suitable place where beginners could acquire a basic level of playing skill and knowledge of golfing courtesy, before they venture out onto a regular golf course. Short hitters have great trouble scoring well on long holes. Smaller, easier, shorter and less expensive golf courses are ideal places for beginners to gain needed golfing knowledge and skills. Shorter courses better fit shorter hitters. What is a smaller golf course? Smaller courses have a lower total par, shorter length and possibly even fewer holes than regular courses. This diminished size results in lower costs, quicker playing time, not such discouraging difficulty to both shorter hitters and less-skilled golfers and reduced effect on the surrounding environment. These layouts carry varied labels as short, executive, par-3, pitch-and-putt, junior, teaching or academy, Cayman and, in Europe most often, compact courses. They can be compared to beginners or novice slopes in skiing and the slightly longer smaller courses to intermediate slopes. What courses or slopes are called is not as important as what they accomplish and who will benefit from them. As already suggested, smaller courses are an excellent grounds for beginners to learn primary performance skills and how to act on a golf course. By this, when new golfers do get on bigger courses, they aren't as likely to hold up those playing behind them or do damage to the course. Being shorter, these courses are also easier to walk and so encourage walking more. We hear and read most about the famous, highly-ranked courses where pro tournaments are held. Do any of those courses have a smaller second course? Pebble Beach has a "cute smaller brother", named the Peter Hay Course. Before a round at Pebble, tale a few wedges and a putter and have a go at the Hay. Pine Valley calls its the Short Course. Its 10 greens duplicate or are similar in character to those on their always close-to-the-top ranked course. Olympic Club has a smaller nine-hole course called the Cliffs designed by Weiskopf and Moorish to go along with their two full length courses? 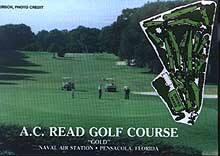 The card from the wee course for A.C. Reid G.C. in Pensacola. In addition to the 36 holes, Turnberry has a small course in front of the hotel. That's where Jack Nicklaus and Tom Watson spent an evening after an Open Championship, going round and round -- and not in verbal disagreement. The above may sound like course name-dropping and it is. 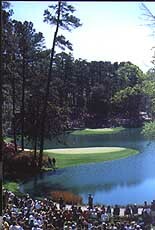 But some less widely known golf facilities also have both big and small courses. These include the municipal courses in Smithtown on Long Island, the Columbus Country Club in Ohio and a course with a par of 60 to go with three traditional-length nines at the Pensacola Naval Air Station's golf club. On the European continent, a number of clubs provide a smaller course that can be played by any member or member's families. A smaller second course is not like inventing the wheel, again. A small course does not even have to be a second course, it can be the sole golf course or with a commercial driving range. What are some compelling reasons for a public, resort or membership facility considering having a smaller second course? For kids and all beginners -- Accessible and affordable courses for kids in America is now a hot topic and should be. A smaller course can be the perfect place for young people to learn, practice and play golf for a while, without interfering with experienced golfers on the main course. Because of their scaled down size, in fact, these are ideal for people of any age taking up the game and for getting to feel more comfortable at golf. The holes are not so demanding as to discourage neophytes and cause them to quickly quit. For lessons -- Smaller courses have an atmosphere of lower intensity because foursome playing behind are not so likely to be pushing, pushing, pushing. Individual and small group instruction is practical in these casual surroundings. This is not only for teaching shot techniques under course conditions, but where golfing etiquette is easier to demonstrate. Here is where anyone can become "educated", who hasn't yet learned not to commit the "sins" of dragging ones spikes on greens, not repairing their ball marks, not fixing their divots or not raking the sand after they've taken several hefty blasts in it. Playing without delay takes everyone time to accomplish and on a smaller course it can at least start to be understood. For shorter hitters -- Short courses better fit short hitters, whether men of any age, woman, juniors, seniors, small, tall, not-so-athletic, disabled persons, anyone. Shorter hitters want to enjoy the pleasures of being able to reach greens in regulation just like the "King Kongs of the courses", who can reach any golf hole of any length. For short game practicing -- Length is important in golf, however, around the green is where those unwanted extra strokes can most easily be "melted away". A not so busy small course is great for anyone to practice their short game. For peak playing times -- A second course can be an entertaining "holding area" or alternative for golfers, when there will be no starting times available on the main course for a while. For walking and quicker playing -- A smaller course takes less time to complete a round on and is easier to walk. Each of these appeal to part of the golfing population. For economy -- The fees to play small courses are always lower, some a lot cheaper, than the fees for regular courses. This saving, along with adding (actually subtracting) a cart fee, for some players can be critical. For many young and even older people, whoever's recreational funds are limited, the savings can mean the difference between golf or more golf or no golf. For families with several members wanting to play, the total savings can really be substantial. In addition, think of these! -- A course already having a full-sized 18 will find little need for additional maintenance personnel, equipment and materials for a smaller second course. For a new facility, both courses could be constructed at the same time with the resulting economy of scale. A club could more quickly open a smaller course to allow its members, new to the game or experienced, to start swinging earlier than waiting the longer time it takes to open the larger course. Longtime golfers with a regular-sized home course already and buddies to play with likely will have little use for a smaller course. They might even say, "Those aren't real golf courses." That's okay! The mainstream of golf will continue to be at "championship" and "regulation" golf courses. But maybe everyone doesn't want to or can't pay the fees, sit impatiently in a cart for most of five hours or be satisfied with seldom breaking 95 on a regular course, mainly because they can't hit a golf ball far enough. Only pride or ego would keep a number of these golfers or beginners off a smaller course, if a suitable one is available. No one is immediately a golfer. It takes learning, time, practice and playing. The first stage could be on a smaller course. A lot of people will never be able to hit a long ball or have a single-digit handicap. Smaller courses can seem made for a large number of these folks. Some parents would like to play golf with their children. Even young children could be included in the foursome, if there is a small course available which welcomes all ages. Have you seen a video clip of a tiny Tiger Woods? If one lives long enough and continues to play golf, eventually everyone will lose desired distance. When this happens, shorter holes become more satisfying to even avid golfers. The shorter the total length of a course, the more feasible it is to walk -- an original exercise of golf. All golf courses provide their players a breath of fresh air, the outdoors to occasionally hear birds sing in, a game requiring concentration on making good shots to score well and for a while escaping the difficult routines of regular life. A smaller course can be a smart place for many golfers to partake of these joys!